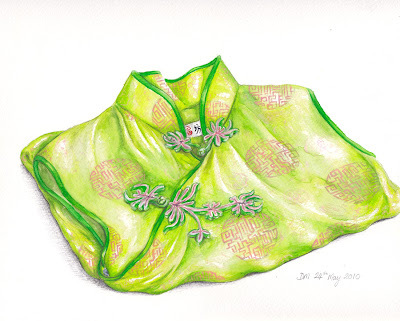 acrylic then used a green watercolour wash.
That colour is so lucious, both sketches are really good but I prefer the position of the cheongsam in this one. I keep looking at all that detail and admiring your patience! Beautiful with color on it! Wow...beautiful details, beautiful color, beautiful everything!